: For the undead creature of Haitian Vodou|Vodou lore, see zombie . For other meanings, see Zombie (disambiguation) . The Zombies is an English Rock music|rock band, formed in 1961 in St Albans and led by Rod Argent , on piano and keyboards , and vocalist Colin Blunstone . The group scored a UK and US chart-topper|hit in 1964 with " She's Not There ". In the USA two further singles, " Tell Her No " and, in 1968, " Time of the Season ", were also successful.Allmusic|class=artist|id=p5908/biography|pure_url=yes allmusic Biography. Their 1968 album Odessey and Oracle , comprising twelve songs by the group's principal songwriters, Argent and Chris White (musician)|Chris White , is ranked 80 on Rolling Stone magazine's list of the 500 Greatest Albums of All Time. http://www.rollingstone.com/news/story/5938174/the_rs_500_greatest_albums_of_all_time The RS 500 Greatest Albums of All Time : Rolling Stone. The group formed in 1961 in St Albans , England, and gained their initial reputation playing the Old Verulamians Rugby Club in that city. The group was formed while the members were at school. Some sources state that Argent, Atkinson and Grundy were at St Albans School (Hertfordshire)|St Albans School , while Blunstone and White were students at St Albans Boys' Grammar School (since renamed Verulam School ). http://www.hendontimes.co.uk/archive/display.var.434582.0.zombies_heyday_recalled.php Zombies' heyday recalled - The Hendon Times. http://www.classicbands.com/zombies.html Classic Bands ï¿½ The Zombies. Argent was a boy chorister in St Albans Cathedral Choir . After winning a beat-group competition sponsored by the Evening Standard|London Evening News , The Zombies signed to Decca Records|Decca and recorded their first hit, " She's Not There " (Argent's second song , written specifically for this session), which was released in mid-1964 and peaked at number 12 in the United Kingdom|UK , where it was their only UK Top 40 hit. This minor-key, jazz -tinged number, distinguished by its musicianship and Blunstone's breathy vocal, was unlike anything heard in British rock at the time. It was first aired in the United States in early August 1964 on New York City rock station WINS (AM)|WINS by Stan Z. Burns, who debuted the song on his daily noontime "Hot Spot". The tune began to catch on in early autumn|fall and eventually climbed to #2. Like many other British Invasion groups, The Zombies were sent to the United States to tour behind their new hit single. Among their most memorable early U.S. gigs were Murray the K 's Christmas shows at the Brooklyn Fox Theatre, where the band played seven performances a day. Hugh Grundy later recalled also contributing to the sets by the Shangri-Las & mdash; not as a musician, but by revving a motorcycle brought backstage as a sound effect for their performance of " Leader of the Pack ". In January 1965 the band was set to make their first in person appearance on U.S. television. The Zombies were to appear on the first episode of NBC's Hullabaloo (TV series)|Hullabaloo . They played "She's Not There" to a screaming hysterical audience full of teenage girls. After the follow-up single "Leave Me Be" stiffed in the UK (and not issued as an "A" single in the US), Rod Argent's "Tell Her No" became another big seller in the United States (in 1965), but failed to make the Top 40 in the band's native UK. Subsequent recordings such as "I Love You" (which became a hit for People! in 1968), "Indication", "Whenever You're Ready", and "Is This the Dream" failed to achieve the success of the previous two singles (although they had continued success in Scandinavia and the Philippines). In 1967, The Zombies signed to Columbia Records|CBS Records , for whom they recorded the album Odessey and Oracle . (The word odyssey was misspelled by cover designers.) Because the band's budget could not cover session musicians, they used a Mellotron , a device designed to imitate orchestral sections. By the time Odessey and Oracle was released in April 1968, the group had disbanded. The album sold poorly and was only given a U.S. release because musician Al Kooper , then signed to Columbia Records, convinced his label of the album's merits. An album track, " Time of the Season ", written by Argent, was released as a single and eventually (1969) became a nationwide hit (Billboard #3). After The Zombies disbanded, Rod Argent formed a band called Argent (band)|Argent , with Chris White as a non-performing songwriter (it should be noted here that the Chris White who had a hit in 1976 with the single "Spanish Wine" is a different person). Colin Blunstone started a solo (music)|solo career after a brief period outside the music business, including working in the burglary claims section of an insurance company. Both Argent and White provided him with new songs. He also did studio vocals for The Alan Parsons Project. In 1991 Blunstone, Grundy and White briefly reunited as The Zombies with guitarist Sebastian Santa Maria and recorded the album New World . A 1997 120-track compilation of the original band's work, Zombie Heaven , was released on UK Ace/Big beat. The compilation contains all the band's Decca/Parrot recordings (in mono), the entire "Odessey And Oracle" LP (in stereo), the material that would have made up the unissued "R.I.P." LP, several unissued recordings and a disc of recordings made for the BBC. On 25 November 1997, all five Zombies reunited at the Jazz Cafe in London's Camden Town as part of a solo show by Blunstone to perform "She's Not There" and "Time of the Season" to promote the release of Zombie Heaven. Blunstone and Argent reunited for an album ("Out Of The Darkness") and tour together in 2001 under the Blunstone & Argent moniker and continued playing live shows together into 2004 when they began going out under the name "The Zombies" again. The new line-up included Rod's cousin Jim Rodford (formerly of The Kinks and Argent (band)|Argent ), his son Steve Rodford on drums, and Keith Airey (brother of Don Airey ) on guitar. In 2002, Ace/Big Beat released the 48 track "The Decca Stereo Anthology", which, for the first time, mixed all of the Decca/Parrot recordings into true stereo. An album of new material released in 2004, As Far as I Can See... , received poor-to-scathing reviews from both Pitchfork and Allmusic., but better reviews elsewhere. Guitar ist Paul Atkinson died in Santa Monica, California , on 1 April 2004. Having retired as a performer, he was an A& R man for many years. In 2005 Blunstone and Argent released a DVD and 2-CD album ( Live At The Bloomsbury Theatre ) and continued touring with the Zombies. | accessdate=25 May 2010. Blunstone and Argent's respective websites had advertised that the 8 March concert was recorded for a CD and/or DVD release later in 2008, and the CD was officially posted by Amazon.com to be pre-sold for a release of 1 July 2008. Both CD and DVD were official released in the UK and several countries around the world. 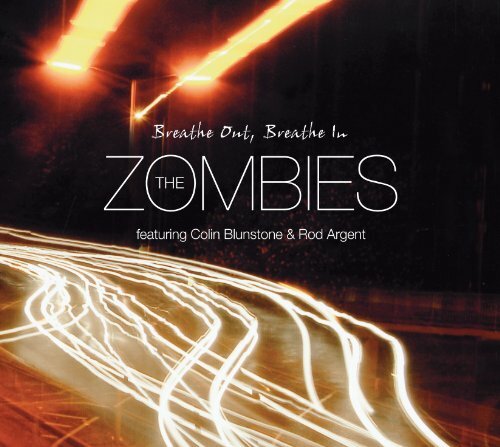 In 2010 Tom Toomey replaced Keith Airey on guitar, and in 2011 "The Zombies featuring Colin Blunstone & Rod Argent" released their new studio album Breathe Out, Breathe In . Reviews were generally strong, and included 4 star reviews from publications including Record Collector , Q (magazine)|Q , Uncut (magazine)|Uncut , the Daily Mirror , and The Independent . The band tour the USA and Canada every year now, as they also do in The Netherlands and the UK. 2011's tour schedule will include Japan, France, Germany, Greece, and Israel. Full listings of gigs when confirmed are published on the band's website. Original members are in bold . The Zombies (album)|The Zombies (U.S.) (1965) #39 U.S.
Odessey and Oracle (1968) #95 U.S.
Time of the Zombies (1974) (Contains hit singles, "Odessey & Oracle" and tracks from their unreleased LP) #204 U.S.
" I Love You (The Zombies song)|I Love You " was later a hit for the band People! Crowded House recorded, released and occasionally perform " She's Not There ". Dave Matthews Band began occasionally performing " Time of the Season " on their 2005 summer tour, and subsequently released a live version on their Weekend on the Rocks CD and DVD later that year. Both "Time of the Season" and " She's Not There " were covered on American Idol by Blake Lewis and Chris Sligh, respectively, on the sixth season British Invasion episode. In Quentin Tarantino 's Kill Bill Vol. 2 , the song "About Her" is a remake of "She's Not There" by Malcolm McLaren . Santana (band)|Santana recorded a version of "She's Not There" and released it as a single and on their Moonflower (album)|Moonflower album in 1977. Manual Scan recorded a cover of "It's Alright With Me" included on their 1989 EP, Lost Sessions . The Shambles recorded a cover of "You Make Me Feel Good" for their 1995 album, Reviving Spark . The Necro song " Who's Ya Daddy " samples "Time of the Season". OK Go covered "This Will Be Our Year" it appeared on the Future Soundtrack for America compilation (2004) and the John Tucker Must Die soundtrack (2006). Jon Brion has covered multiple Zombies songs live, including "Time of the Season," "This Will Be Our Year," and "She's Not There". Once, he invited the audience member who had requested the song to join him on stage and sing the lead vocal on "Care Of Cell 44". The late Elliott Smith performed "Care of Cell 44" and "This Will Be Our Year". Matthew Sweet and Susanna Hoffs covered "Care of Cell 44" on Under the Covers, Vol. 1 . The Tough Alliance recorded a cover of the song "Hung up on a Dream", released as the b-side of their single "First Class Riot" in 2007. Dinosaur Jr. covered "Whenever You're Ready" during the recording of their 2009 album, Farm (album)| Farm . Anthony Green (musician)|Anthony Green performed "This Will Be Our Year" on his acoustic tour with Days Away . The Canadian indie-rock trio Immaculate Machine has been knownWho|date=March 2009 to cover "Time of the Season" live. Lois Maffeo|Lois recorded "The Way I Feel Inside" on her Strumpet album. The Beautiful South re-recorded "This Will Be Our Year" on their cover album Golddiggas, Headnodders and Pholk Songs . Gym Class Heroes covered "Time of the Season" on their Campus Tour in 2008. Of Montreal covered "Friends of Mine" on their compilation If He Is Protecting Our Nation, Then Who Will Protect Big Oil, Our Children? Belle & Sebastian covered "Time of the Season" at Glastonbury Festival 2004. Panda Bear (musician)|Panda Bear sampled "Leave Me Be" in his live song "Song For Ariel". Tom Petty & The Heartbreakers released a live cover of "I Want You Back Again" on their 2009 album " The Live Anthology "
Country artist Juice Newton covered "Tell Her No" on her 1983 album " Dirty Looks "
Japanese Group Sounds band The Carnabeats covered "I Love You" as their debut single (1967), which was a big hit in Japan. Shaw Blades|Shaw-Blades covered "Time of the Season" on their 2007 album Influence . The Foo Fighters covered "This Will Be Our Year" for their Record Store Day exclusive, Medium Rare. Copyright 2011, iCubator Labs, LLC, All Rights Reserved.